This week's photo prompt is actually an advert on Etsy. 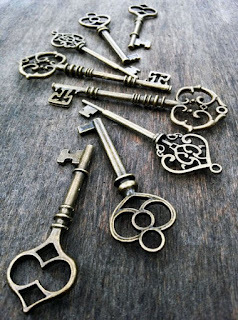 Antique keys seem to be popular. 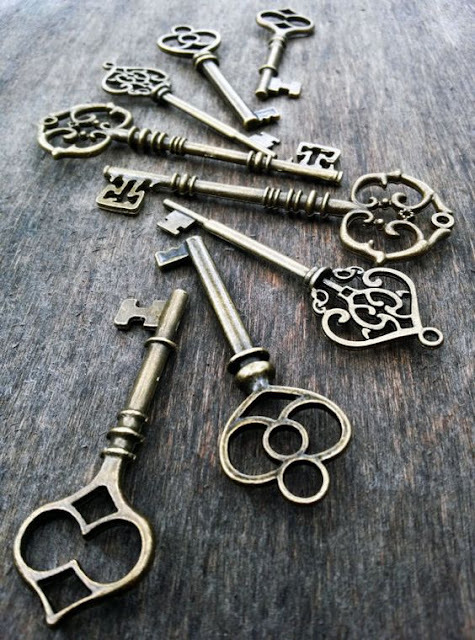 I have always been fascinated by keys and doors - and the metaphorical meaning of both. Looking forward to seeing what this might inspire. And so, here is my entry for this round of the Mid-Week Flash Challenge... It's definitely horror, a little odd, and a bit gruesome, so be forewarned! Chloe's torments were just a merely to Reynard. He enjoyed his diversions with her inside the ancient catacombs beneath the church. They were perfectly suited for his amusements, and as a prison—for Chloe. Other than the obvious lack of freedom, there was never physical abuse in the way most would think. Reynard made sure his playmate ate well and provided for all the basic comforts. It was the constant toying with her mind that somehow brought him twisted pleasure. Taking her to the edge of sanity—then pulling her back before the next round—this was what he found exciting. Today, however, Chloe dared to believe her luck had changed; the game would end differently this time. While delivering her mid-day meal he placed his keys on the table near her cell, all held together by a shiny metal ring. As he talked, or should one say mocked her helplessness, they slipped to the floor when he bumped against the table, falling just out of his sight. As he continued to tease about her failed efforts to escape, she forced herself to look away from their location, hoping against hope they would remain unnoticed. After what seemed an eternity, Reynard left. Still, Chloe made no effort to retrieve the keys until his footsteps faded completely. When only silence could be heard, she edged closer to the bars, her slender arm stretching through. The tips of her fingers barely touched the ring, but that was enough. Once the keys were in hand, she held them up and smiled, even laughing a little. Reaching around the bars, she placed each one into the keyhole of her cell door, turning it as quietly as possible until one pulled the deadbolt back into the lock. She opened the door only enough to squeeze her body through. A squeaking hinge might be enough to alert her captor. The tunnel to the left led back to the church—and Reynard. The path Chloe suspected would lead to an exit went to the right. She had been partway down it before during one of Reynard's games. Walking quickly ahead, she soon encountered a locked door. Not long after finding its matching key, another door appeared down the tunnel, and then another. Testing each for the right key, every success provided a few more yards of freedom. Finally, Chloe came to a door unlike the others. It was much heavier. She could hear something beyond, perhaps a bird singing, though the sound was faint. She inserted each key into the lock, but none fit. She tried again. Surely Reynard would return and find her before she could escape. Chloe panicked, wondering if there would be time to try another route. The answer came quickly enough. When she turned, he was leaning against the wall, his arms folded. "What? Did you think I would make it that easy for you to escape? There are eight keys, but nine doors between you and freedom." Reynard sported an irritating smirk as he bent forward putting his face close to hers. "No, girl, you'll never see the light of day." Chloe felt the useless keys in her hand. Her anger grew as he laughed, the disturbing noise echoing through the tunnels. Summoning all the strength her body could muster, Chloe thrust the metal shafts deep into his eyes. He staggered backward, covering his face with his hands, painful wails filling the catacombs until he collapsed, the ornate brass ends still protruding from bloody sockets. Chloe sat on the floor, giggling as he writhed in agony, blood seeping from between his fingers. She had played the game well, rigged as it was, and managed to pull off a draw. Now, with both players a prisoner of sorts, the game could continue, but only madness remained to crown the victor. Dark indeed! Nice ending. Just desserts! Thanks for joining. I haven't had much time for writing lately, but I did manage to sneak a little flash fiction in even if it was a little late. Thanks for reading and commenting!